First, an explainer about who this nebulous Strategy Group is, and why they exist. After the 2013 season wrapped up, the inclusive Technical Working Group and Sporting Working Group were replaced with the Strategy Group, which isn’t inclusive at all. Five of the most successful F1 teams got a permanent spot on the Strategy Group: Ferrari, Mercedes, McLaren, Red Bull and Williams. The sixth and final team space is the next highest-placed team in the constructors’ championship. For this year, that is Force India. Each team gets one vote, and additionally, the FIA and Formula One Management (read: Bernie’s buddies) have six representatives with one vote each. The F1 Strategy Group is the most point-blank illustration of the “haves” and “have nots” in Formula One that they ever could have designed. The teams who are really struggling to get up to speed, such as Sauber and Manor Marussia, aren’t represented at all. While the expectation is that the Strategy Group is supposed to act on behalf of the good of the series as a whole, let’s not forget that Formula One is a competition among these teams. Of course teams are going to vote in their own best interests. We have nothing, as such, against a group that looks at certain matters and can bring up ideas and also maybe say that this is the right way to go ahead but what matters is that all interests should be represented. Teams like Force India or Sauber are part of the competition and we cannot be happy by being excluded by this group because we do feel that we have to ensure that that’s where the danger lies that there’s a proper representation of interests in there. Fast-forward a year to the current season, and Force India is in as the sixth member of the group, and now taking heat from the smaller teams over a perceived change in attitude. Force India went from vocally calling out the Strategy Group as possibly illegal to being vehemently opposed to letting cash-strapped Manor Marussia use an older car to start the season. That Marussia spat illustrates the problem with having no representation from the smaller, struggling outfits at the table: Force India stood to profit if Marussia didn’t make the grid this year. All of the smaller teams would get a larger share of F1’s commercial rights income if Marussia didn’t show up for 2015. A unanimous decision was needed to allow Marussia the exception from the rules, so when Force India voted no, it was done. Either way, teams will always vote in their self-interest. That’s the name of the game. The fact that the other six votes lie with Bernie’s team doesn’t give me much hope for positive, series-saving change, either. Bernie’s taken a very “let them eat cake” attitude towards the plight of smaller teams in the past. I think we will spend probably four or five hours in that meeting. In the end we’ll probably decide the date of the next meeting. The problem with us at the moment is we’re a democracy. It’s no good. 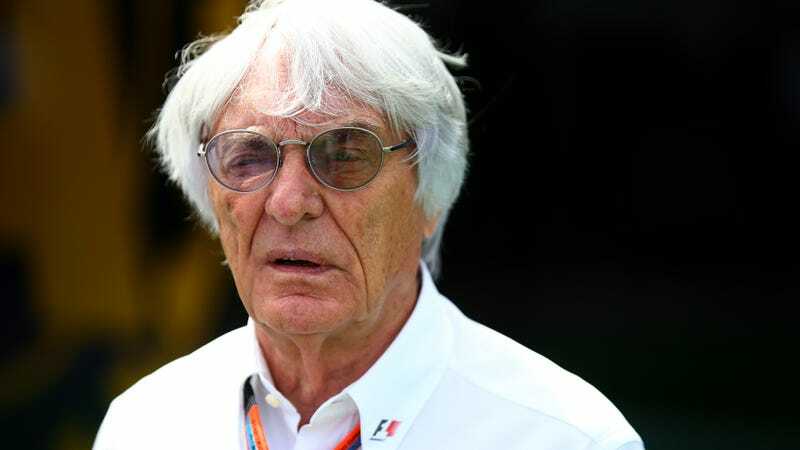 According to Autosport, Ecclestone met with FIA president Jean Todt prior to today’s meeting at Biggin Hill to try and help push through meaningful changes to the series. He’s not even sure that will work, though. Sounds like Bernie just wants to be Dictator of Formula One. As useless as the Strategy Group is, though, this is the one time I’m glad they’re there: to balance out Bernie Ecclestone’s wild ideas. That’s not to say the teams are going to get much done in this meeting, either. Oh, to the contrary. It sounds like the teams vs. other teams vs. FOM/FIA gridlock will likely produce earth-shattering decisions like “people who put the toilet paper roll facing inwards should never be trusted with toilet paper” and/or “this pen is out of ink, and I shall get a new one” as opposed to anything to advance the series at all. The F1 Strategy Group has proven to be so ineffective that the guys over at F1Fanatic are even arguing that no decision out of the Strategy Group’s meeting would be the best one. We don’t need a costly half-solution or another gimmick. We need them to stay out of it for a while. In the main we should perhaps think about stopping tampering with it rather than thinking we’re going to create a new set of rules and that’s going to fix everything. Every time you create a new set of rules, you’ll usually find the people with the biggest resource or with the cleverest thinking, or the people who stopped working on the current generation of Formula One cars, come out with quite a big gap. That’s what, when we talk about these boring races, that’s what we’re referring to isn’t it? A team dominating at the front – but a team dominates when we have radical rule changes. I think that we do have to seriously think about not changing anything. Could he have nailed it? There are always a billion tweaks and fixes rumored to be happening, but will any of them get to the heart of keeping the sport alive? Let’s look at what’s actually getting discussed in this round. There are no shortage of important issues on the table. For one, there’s the constant threat of a shrinking grid. Caterham left last year due to financial issues, Manor Marussia almost left for the same reason, and Red Bull keeps threatening to ragequit because Renault can’t get their engines right. Furthermore, how do we ensure that Haas F1 isn’t another one-or-two-years-and-done entry? The American effort has more promise than most, but the astronomical costs of Formula One participation don’t seem to affect most members of the Strategy Group, anyway. Excluding Force India, these are the teams that voted for the new expensive hybrid power units despite financial concerns from the smaller teams. Plus, all the Mercedes-powered teams who are doing well under the current formula seem unlikely to want to fiddle with anything power unit-related that wouldn’t benefit their cars. According to Adam Cooper’s F1 Blog, Ecclestone isn’t completely ignoring the plight of the smaller teams anymore. He wants to introduce a less expensive engine spec package that would either be a V8-KERS engine or a twin-turbo V6-KERS engine. These less expensive alternatives would (in theory) be comparable to the V6 hybrid turbo engine’s performance and therefore keep teams on the grid. All teams using all specs would be limited to the same 100 kgs of fuel per race, regardless. Rumors are already surfacing of Cosworth as a potential supplier, and who knows who else might be interested. Will the existing teams go for sharing a grid with teams that run those cheaper engines, though? We’re not sure. Two major concerns exist. If the engines aren’t equal in performance, it would effectively create a second class in F1 racing, which no one wants. That’s the problem this proposal is trying to solve, after all. If they are equal in performance, the low-budget engines could force the manufacturers of the existing, pricier power units to lower their prices in response. Given that three of the six teams represented are a manufacturer’s main squeeze (four if you count Red Bull, who aren’t happy with their manufacturer right now), they don’t seem likely to vote to have any low-cost competition to their customer units at all. Cosworth, of course, doesn’t have a seat at the table. Ecclestone has proposed another cost-cutting measure in addition to the multiple-engine formula: a ban on wind tunnels. According to Autosport, this could save teams up to $15-20 million a year. However, teams with access to wind tunnels (read: all of the “haves” in the Strategy Group) are unlikely to approve of that. Computational fluid dynamics (CFD) technology isn’t quite on the same level as wind-tunnel development, either. The series’ only CFD-only developed car so far was the Virgin effort, which was the backmarker team that is now Manor Marussia. Read: backmarker. Even they gave up on the idea after a while, as they now use a wind tunnel in development. Autosport mentions that if the wind tunnel ban fails, there’s another proposal to discuss from the smaller teams to revise the payment structure for the power units to the manufacturers, and perhaps another proposal yet to revise the distribution of Formula One’s revenue among the teams. The idea with revising the power unit payment structure is for the manufacturer to keep more of the costs of developing the power units and not pass those costs (or as much of those costs) along to customer teams. This would make the cost per unit more affordable for many of the smaller F1 efforts. As for the distribution of funds goes, if there’s anything last year’s numbers show, it’s that the richest teams keep getting richer, and the back of the field gets nowhere near the amount from Formula One that the front runners do. What the smaller teams are asking for seems perfectly rational in terms of the series’ health: distribute F1’s income more evenly so that the smaller teams have a chance, and pass fewer development costs down to them. That being said, “Hey, guys! Let’s vote to give ourselves less money!” doesn’t seem like a thing the teams on the F1 Strategy Group will go for, so I expect more of the same for those two. Cake is clearly too pricey. Let them eat leftover scones from whatever bakery serves Biggin Hill. Speaking of engine and development matters, that brings us to another item of discussion: the sound and experience of the sport. No one (except perhaps Mercedes) is in love with the quieter Formula One engines of today. The drama isn’t there anymore, and many fans blame the sound of the races itself. The chairman of the Formula One Promoters’ Association is even calling for a return to louder, more economical power units in light of the shrinking grid as well as the fans’ experience. The only problem with a return to a V8 or even a non-hybrid V6 would be that you’re starting everyone back off at square one after a couple years developing the current hybrid power units. As the latest power unit switch showed, series resets like that are expensive, although you could argue that switching to a less expensive power unit could be good for the series’ health in the long run. Either way, teams have insisted that upgrades to the engine that are on the table involve boosting the existing hybrid V6 units up to 1,000 horsepower. Red Bull, who is on their final allowable engine of the year for Daniel Ricciardo’s car, is also pushing to change the season rules to allow for five power units. Honda, too, has been struggling with their engine design for McLaren and has expressed support for the change. We agreed, or all the teams agreed, to have five engines during the year. We’ve got four in the regulations, and now people are saying maybe it should stay four. People who supply the engines don’t want to supply more unless they get more money, the teams can’t afford it. The other teams would, of course, have to bear the costs of the fifth engine if that’s passed, which is something the teams with working power units are unlikely to want to do. Force India uses Mercedes power units, as does fellow F1 Strategy Group member Williams. Sorry, Red Bull (and/or Honda). No mercy for you. Finally, there’s the issue of putting whatever power you’ve got to the ground: tires. Pirelli’s contract is set to end in 2016, so both Pirelli and Michelin have put their names in the hat to supply F1’s tires. David Coulthard argues on BBC Sport that the tires are part of the reason Formula One has become so dull lately: the current tires degrade too quickly, and tire management has overtaken overtaking as a cruicial component of the race. According to Autosport (as reprinted on Racer), Michelin will make a proposal similar to what they do for Formula E. Because they want a real-world connection to what they make for motorsport, they proposed 18-inch wheels again, which Ecclestone quickly dismissed as “horrible looking.” Furthermore, Michelin only wants to enter the series if they’re allowed to make a durable tire. They don’t want the PR disaster that Pirelli got when Formula One asked for tires that degrade faster, Pirelli made tires that did, and tires failed all over. All Michelin would do is make a rock-hard tire that you could put on in January and take off in December, because they don’t want to be in a position where they can be criticized. That would make absolutely 100 percent sure, if there was a question mark about Mercedes winning, it would be removed. It would be all the things we don’t want, and goes against all the things Pirelli have had the courage to do from what we have asked, which has made for some bloody good racing. If we had a rock-hard tire, we could just forget about that. Can I just say that I’m tired of 18-inch street tires, too? Long live the 944’s 15-inch cookie-cutters! Michelin, however, has done a fantastic job of making the World Endurance Championship’s tires last long and not produce boring races. As Coulthard argued on BBC Sport, the drivers in the WEC can push throughout the whole race, while drivers in F1 are having to slow down so they don’t munch the craptacular Pirellis before the end of the race. F1 teams have nailed this spec of tires so that there’s less blow-outs nowadays, but “nailing it” means driving below the cars’ capabilities lap after lap, which is less exciting. For Ecclestone to dismiss long-lasting tires as dull is missing the point. We need more durable tires in Formula One to allow the racers to go back to racing, which is what fans of racing want to see in a sprint-race like F1. Tire management is neat, but hardly the seat-of-your-pants action the series is lacking at the moment. Pirelli, on the other hand, is expected to put forth a proposal to switch from 375 mm-wide tires to 425 mm-wide tires, the likes of which were last seen in 1992. That’s a good enough width for putting 1,000 horsepower to the ground, right? Right. The cars should at least look cooler if they go wider, so that’s at least one point in favor of the renewing Pirelli’s contract. The problem is that F1’s problems go much, much farther than the look of the cars, and no one expects the group tasked with fixing those issues to actually do so in today’s meeting. Things need to come to a head. Changing the wheel nuts and standardizing gear ratios is not going to help the little teams, have an impact on costs for the bigger teams, or improve the show. You have to look at something much more fundamental than that. It needs to be taken out of the teams’ hands because I don’t think the teams will ever agree. There is too much vested interest, too much competitive advantage or disadvantage people are trying to protect or expose. If the FIA [Todt] and FOM [Ecclestone] are fully aligned it doesn’t matter what the teams say. They just need to agree between themselves on what they want. There’s your problem: everyone agrees that changes must happen for the series to evolve, grow, and once again be worthy of being considered the top series in motorsport, but no one can come to agreement as to how to do that. Either way, the changes F1 needs probably won’t happen when they’re voted on by the teams who are doing well under the status quo and the leadership that got them into this mess in the first place. Update: Initial reports from today’s meeting are positive, like something actually happened! Only time will tell if that decision was pro- or anti-tuna-sandwiches for the next meeting, or, y’know, actually relevant to the sport itself. Motorsport.com says that a full report on what was decided is expected to land as early as tomorrow morning, and that any changes passed by the F1 Strategy Group will go on to the F1 Commission. There, any proposed changes will need unanimous approval to be applied for 2016, and a majority approval to be applied for 2017. From there, approved changes go on to be ratified by the FIA World Council on July 10.